Curly Russell, bass; Art Blakey, drums. Both are 25 years of age, and have had varied experiences playing most every type of popular music; Clifford with many of the blues bands in the area; John, most notably as solo clarinetist for two years in an Army Air Force Band, and more recently as featured tenor soloist with a large band that Earl Hines assembled for a nation-wide tour as part of a show with the Harlem Globetrotters. (He is now featured with the exciting experimental octet of Sun Ra). Clifford has been playing 11 years, John, 10. The rhythm section assembled by Blue Note for this session is a superlative one, indeed. Returning, on bass, from the Griffin LP is Curly Russell. The leader of the Jazz Messengers, Art Blakey, is our percussionist for the date, and his reunion with pianist Horace Silver, grooved herein for posterity, is an electrifying one. Both seemed to feel greatly the nuances and anticipations so necessary to create an integrated and interesting rhythmic pulse. Their help in stabilizing a young nervousness, most naturally encountered on a first solo record date, is of inestimable value. Horace, incidentally, is greatly responsible for bringing John and Clifford to Blue Note's attention. He bacame enamored of their talents jamming with them while appearing in Chicago with the "Messengers." Clifford plays the lead parts in all of the ensemble work, and his mellower tone is readily distinguishable from Gilmore's harder, more punching sound. "Status Quo," an original by John Neely (another fine Chicago tenor man), kicks off side 1 in a bright, hard-driving manner, with Gilmore taking the first tenor solo. Art's gutty fill-ins and solo are standouts in this cut which exhibits just how beautifully happy good jazz can be. Clifford Jordan's Latin flavored "Bo-Till" follows. His is the first solo, and it sings as prettily. Horace presents here one of the most reflective and simply swinging solos of his entire recording career. Side 1 closes with Gigi Gryce's "Blue Lights," quickly becoming a Modern Jazz standard. Gilmore solos first, and plays some very challenging chord changes. During Horace's solo, he and Art build the tension to an almost unbelievable pitch with their famous "double timing," only to swing twice as much when they resume the regular time. In this tune, Curly reminds the Jazz world that he deserves more solo space. "Billie's Bounce," taken a little faster than usual, creates an in-person jam session feeling with its unrestrained flow of biting solos and exploding rhythmic decapitations. Clifford's "Evil Eye" (minor blues), relaxes the tempo into an easygoing bounce, with John following Cliff, and leading into another superbly well stated Horace Silver solo. Horace's lone composition for the date, a show-type tune he calls "Everywhere," closes the LP, and in many respects is the smoothest flowing selection in the set. Throughout the album, I think you will feel the sincerity of these two young horn men, their obvious difference in tone and conception, and the freshness of their mid-western approach. 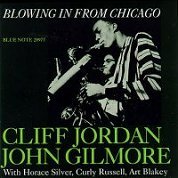 For, with the brilliantly creative musical background that Chicago has given them, it is inevitable that John Gilmore and Clifford Jordan will make an important contribution to the world of Modern Jazz tenor playing. --JOE SEGAL, from the liner notes.